I had some apricot preserves sitting in the fridge so I was trying to find a recipe that included it. I searched on recipezaar and found this recipe that looked very appetizing. Instead of using chicken breasts, I used chicken legs and it came out quite nicely served with white rice. I left out the dried apricots and added honey roasted almonds already sliced from Almond Accents. Adjust an oven rack to the upper position and heat the oven to 450 degrees Fahrenheit. Coat 9 by 13-inch baking dish lightly with vegetable oil spray. Lay the chicken in prepared 9 by 13-inch baking dish. Whisk the apricot preserves, dried apricot pieces, and orange juce into the saucepan with the honey, vinegar, soy sauce, curry powder, and Tabasco sauce, over medium-high heat. Simmer, whisking often, until the mixture has thickened, about 8 minutes. 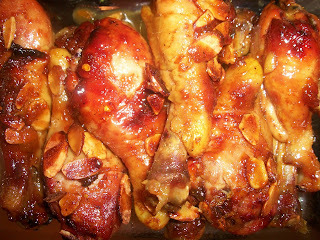 Pour the apricot-orange sauce over the chicken, then sprinkle with the almonds. Bake until the chicken registers 160 degrees on an instant-read thermometer, 15-18 minutes.